Accurate, reliable temperature data is critical for HACCP compliance and brand-specific standards. 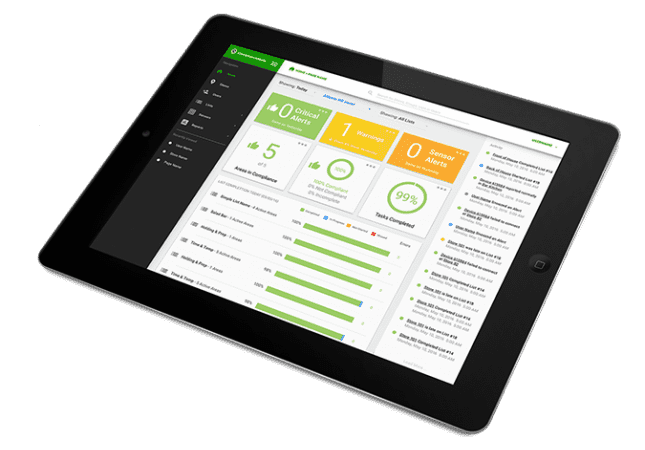 That’s why ComplianceMate enables staff to quickly probe, record, and log product temperatures, critical checks, and corrective actions. An easy-to-use mobile app guides them through the process, so they can log HACCP data and complete checklists easily and efficiently. Management can access paperless, digital documentation of critical data for all stores. Put your time & temp checklists on autopilot. ComplianceMate makes it easy for kitchen staff to log accurate time and temperature data. Integrate any operational checklists, including simple opening/closing checklists and unique, brand-specific guidelines. Move your audits away from spreadsheets and into straightforward, cloud-based tools. ComplianceMate supports any self-auditing checklist. Maintain complete warming and cooling logs with all the data your kitchen staff (and the health inspectors) need. ComplianceMate checklists cover cleaning, too. Add checklists for any cleaning-related compliance, including weekly, monthly, or quarterly tasks. Use checklists as training tools or “how to” guides for brand-specific processes. ComplianceMate supports step-by-step process guidance, including training videos. Access real-time checklist data from any web-enabled device. No matter where you are, you can verify whether staff are completing your operational checklists and view any data they log. Want to know when something isn’t compliant? ComplianceMate sends you an alert, so you can prompt staff to take corrective action immediately. You can also pull detailed, time-stamped reports across any checklists within any date range. When your staff takes corrective action to ensure compliance with HACCP or brand-specific requirements, you can see exactly what happened – in real time. ComplianceMate also supports rich media, like photos and videos, so staff can complement checklist entries with visual documentation. Not only does it help us with food safety, but it helps us train our staff to our standards of safety and quality of our operations. Is this the way of the future? Absolutely, and I am glad we are ahead of the game on this and look forward to more advancements working with ComplianceMate. The system was installed to aid with our Food Safety program by monitoring temperatures of products that had parameters for cooling to a particular temperature within a certain time frame. We have peace of mind that we will get a call should any of the boxes get out of our required temperature range and we can respond to the problem before it becomes a big issue. CALL NOW for this exclusive offer. Fill out the form and a compliance specialist will contact you at the phone number provided.